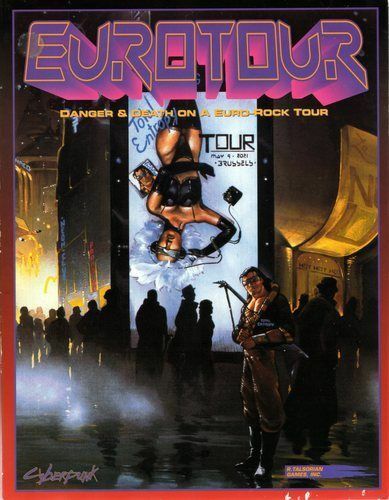 Published in 1993, Eurotour is a more problematic contribution to the Cyberpunk line. 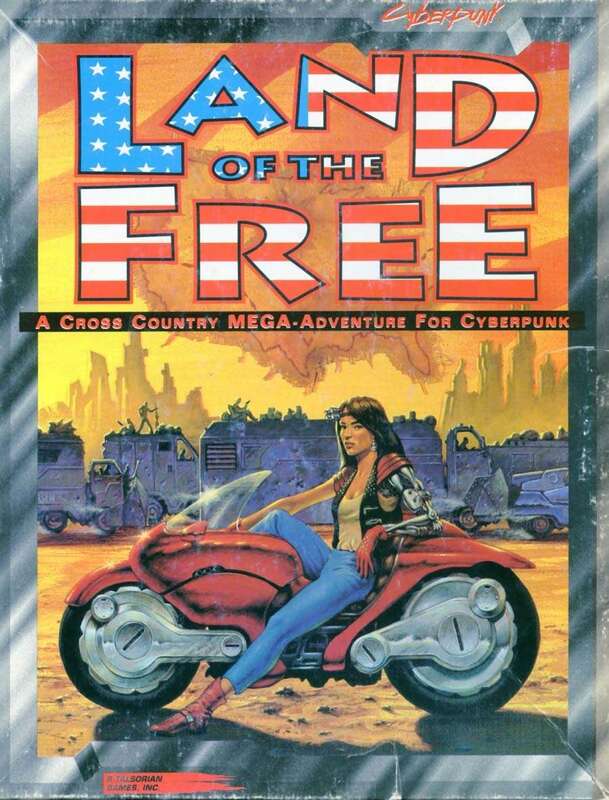 While the cross country, mega-adventure I ran previously, Land of the Free, was mostly just indicative of the 90’s marketing strategy targeting boys and men with disposable cash; basically a lot of sexualized women and some casual sexism. Eurotour has this as well, of course. But It also is, I imagine, why Mike Pondsmith recently has stated that the company and Cyberpunk line wouldn’t see supplemental materials from any writers who didn’t actually live in the specific region the content would target. Sounds like they learned their lesson, as Eurotour and Eurosource Plus appear to have drawn the ire of fans abroad at publication. This adventure has a cyberpunk group make their way to a futuristic version of Europe in 2021. Jack Entropy, a reasonably well known rockerboy, is having a European tour and the punks are along for the ride. There are six modules that take place in a different country and city; each with a fairly different… I wouldn’t say tone exactly, though sometimes that is the case… objective and set piece, let’s say. From having to retrieve the star from a drug-fueled bender on the town; to a party in Paris with an assassin that is a honey pot for Jack; to stopping a bomb going off on a floating stage in Venice, there’s a bunch of stuff to do. My favorite has the PCs on a mission to find a French artist that will be used as a publicity stunt, having the artist create a piece on a side of the building (illegally, of course). Each is pretty different and filled with fairly diverse characters. Some serve as a through-line for the meta plot; my favorite part of the book. At the back there are 6 options to choose from that select who is targeting Jack throughout the tour. While it’s ultimately up to the Referee and the dice to decide how much danger Jack is actually in, the neat thing about it is that your selection alter each module and have clues for the PCs to figure out who means Jack harm along the tour. Each seems fairly fun and features some great art. Just like Land of the Free, these adventures also feature a weird dissonance. There is text that reminds you to portray a specific female character as strong and smart…and then there’s also text telling you to figure out which PC is hard up for a woman in no uncertain terms and embroil them in a plot that features some of that good ol’ casual sexism. I guess Cyberpunk writers reaaaaally love honey pots; if Land of the Free and Eurotour are Representative of the adventures overall, anyways. Basically, because it’s written in the 90’s you can expect some sexist tropes that is at odds with some of the goals of the text. However, just like Land of the Free, the art is in contrast with this, featuring more diversity than you’d expect. The art director clearly was a bit more aware than the three writers. I’m guessing that adventures that remind you to portray a particular woman well vs the very tropey ones may be different writers. But it leads to, as stated, a weird dissonance and hinders the overall product. The other thing I had a problem with is the final adventure, which has the characters caught up in a very weird tonal shift as they’re coerced into stealing the crown jewels. Uh, what? Up until then they’re like weird side hands for the project that deal with all these requests and threats to Jack and the tour. Suddenly they’re off on this module that is roughly double the length of the others and seems completely at odds with the other content. Another break from what the goals seem to be leading up to it. Overall, I’m still running it. I’m just cutting out a lot and changing some things up. More on that below. I’m running this game for The Gauntlet this month. 4 sessions and six adventures. While Veil 2020 cuts out a lot of the time spent on skill checks and long combat engagements, I doubt I could squeeze it all in. Luckily, two or so don’t speak to me much anyways, so I cut them out. They’ll travel to Brussels and are sent to find an artist the tour wants to hire for a publicity stunt. Introduces a mysterious Interpol agent. Depending on how much we get done I may be able to add some other things from other sections in there. But I imagine this will most likely consume all 4 sessions, which are 3 hours long each. I’m also finding my own art for the main cast of the tour because they’re all white or Asian; getting rid of Jack’s “input”(term for girlfriend, nice. ), also referred to as the ornament, who also happens to be an Asian woman. Yeah, pass. I’m also changing Jack Entropy to essentially Ruby Rhod from The Fifth Element, played by Chris Tucker and, while not an alien, will be non-binary, I think. I’ll shop for images on my Veil 2020 Pinterest and add them to the roll20 room so the cast of characters are always accessible there. I’m also expanding Veil 2020 to allow for a little bit of an easier conversion of these Cyberpunk modules. I’m adding the option of using Hit Dice instead of Hit Boxes (basically Harm boxes found in most Powered by the Apocalypse games). Depending on the NPC’s level I can simply roll the number of d6’s equal to it and get their hit points, using the rest of the information provided by the adventure for flavor. Simple. To make them harder or easier to deal with I can increase or decrease the Hit Die; d4 or d8, etc. This will be a good opportunity to test this out and see how it works and scales with weapon damage already established. I’m also going to draft a table for critical hits and add on chips from Cyberpunk 2020’s core book. I also hope to add more cyberware and fashion to this expanded version. I’m excited to be returning to Veil 2020 this month. It’s always a fun time and easy to run! "It all started with a simple extraction..."
Originally published in 1994, Land of the Free is billed as a cross country mega-adventure for the Cyberpunk line of tabletop games popular in the 90's. In this respect it certainly delivers. It also states that it should take about 8 sessions to complete, which I don't think is realistic but more on that later. In this adventure, the punks take on a mission to extract Adriana Young at the behest of her father, Dr. Francis Young. What ensues is the PCs in a cat and mouse race across the country being pursued by her employer, Narcoss, with numerous set pieces depicting what has become of the U.S in the setting of Cyberpunk 2020. The expanded setting can be found in the campaign book to this adventure, Home of the Brave. I’m not sure how long a session the author had in mind, but it took us 11 sessions to complete the game using Veil 2020, a rules-light, modified system based on my own game, The Veil. The system truncates conflicts such as long firefights and other conflicts, designed to specifically be able to run these old-school adventures without the crunch. Our sessions were three hours long and the table was drop in, drop out—resulting in maybe a little bit of time being chewed up by new folks joining. However, the system massively reduces the time it takes to get through encounters and conflicts so didn't contribute that much to the increase in expected sessions. I ended up skipping some areas in the last 20 pages or so to nail the pacing I wanted and cutting out some unwanted, problematic content. Otherwise, it probably would have been 12 or 13 sessions. I ran the adventure rules as written. It was my first time using a module/adventure. Ever. And I wanted that experience to be as close to what the module intended as possible. Time has certainly brought out some blemishes in the adventure. Particularly a lot of sexualized women in the module, most often Adriana Young herself. Sometimes even with weird connotations. For instance, a ninja set out to kill her on a plane might be introduced to the players via hitting on her; after all, she is extremely attractive, the author suggests. There is also a honeypot later in the module, in which a PC is meant to just wander away and witness a woman in lingerie, drawn to music in a house; later being possibly captured by her as she is, of course, a ninja. Each woman in the text is depicted in weird, model poses very indicative of the times. There was also some stuff x-carded at the table, such as going to the south where puritans are running around with confederate flags. That kind of stuff. Adriana Young herself is also a plot device for the players to have their morality tested. Spoilers! A large reward keeps being offered for her to be turned over, as it is revealed that she is not only a clone but also, ala Jonny Mnemonic, carrying secrets from Narcross in her cybernetic mind (in the first couple pages of the adventure but revealed substantially later in the story to the players). The main questions posed via Adriana’s existence are ones that were explored in media like Blade Runner already. If she’s a manufactured being, is she human? How would the world react? How do the players react? Will, they sell her out for a 1,000,000,000 euro bucks or stick by her, ostensibly as she’s made friends with them as the story has gone on. While these questions are interesting in 1994, they feel somewhat dated now; much like the sexualized art. I did appreciate that the whole point of the adventure was for the players to learn that she is a person like any other, though. Literally spelled out in the module at the end. I imagine that when this was run when published it would feel much more substantial than now, as this was not a divisive issue for my players at all. It’s still fun to go through the motions in the module, however. After all the locations are well realized, the characters interesting. It has more diverse art than some do now, even! I was pleasantly surprised in that respect. Everyone had fun, including me. We basked in the retro cyberpunk aesthetic. Old brick phone, 90’s style, over-the-top action. They stuck it to the man every chance they got. While the sort-of grand finale at the end was predictable, the players still enjoyed the cheesy nature of it all in keeping with the 90’s aesthetic. You can still get a lot of enjoyment from these adventures and I learned a lot running this one. I plan to run Eurotour next, in fact. System-wise, Veil 2020 is extremely simple. There’s one roll which encapsulates the stakes of a situation. Players say what they wish to accomplish, the Referee and player set stakes for the role reflecting the context of the situation, and the player rolls 2d6+modifier. The modifier comes from what the player character is feeling, distilled into 6 core emotions which are assigned modifiers. In this way, the players are rooted in their PC throughout. They can also roll normally, with advantage, or disadvantage depending on their fictional positioning, determined by 3 classes (heavily inspired by The Whitehack). There are skill jockies, melee fighters, and hackers, basically. But they’re left up to enough interpretation that many different character concepts can fit into those three categories. Folks could play Shadowrun classes in the game easily, should they want to, for instance. PCs gain experience for completing their missions and Eurodollars, the currency in Cyberpunk 2020, is used in Veil 2020 as well. When you accrue EB in service to subverting or harming an establishment which perpetuates capitalism, that money also is counted as experience. With each level, players choose from two different choices of advancement (and fictional positioning). There are, of course, gear lists and cybernetics the players may choose to augment themselves with as well. Otherwise, that’s pretty much it. This simple system worked well in the module. Stating out the antagonists was easy. Corresponding to their level I chose the same upgrades as the players, or else, if that didn’t make sense for the particular villain or mook, I simply had them deal more damage or be able to take more harm with each level. Easy peasy. You can find Veil 2020 over in The Gauntlet gaming communities’ monthly zine: Codex; featured in Codex Chrome 2 along with some other awesome cyberpunk content. It is no longer in their Patreon feed but should be available for purchase via DrivethruRPG soon. I’m toying with the idea of making a Veil 2030. The word count prevented me from going into more detail and I was also not able to get chip upgrades in the game (ala Hardwired). Having an expanded edition with some additional guidance and more gear and cybernetics is appealing, as I plan on using the system to run a bunch of content and perhaps craft my own. Let me know what you think in the comments; interested to hear what people think of that idea.